The following is an extract from a December 2018 article on the Australian Women Writers website. You can read the full article here. Welcome to the Children’s Round-Up for December, 2018. I’ve throughly enjoying curating the children’s reviews this year, and look forward to continuing on in this role in 2019. It’s been a bumper month for children’s reviews, with thirteen books linked to the AWW blog. Thank you for your continued support of Australian Women Writers throughout the year – the time taken to review books and linking them to this blog is appreciated. 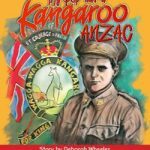 Cass Moriarty reviewed My Pop was a Kangaroo ANZAC by Deborah Wheeler. For ages prep to year six. 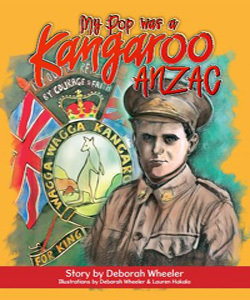 Deborah Wheeler has self-published a loving tribute to her grandfather in the children’s picture book My Pop was a Kangaroo ANZAC (2018). In 1915, her grandfather, William (‘Bill’) James Wheeler, set off from Wagga Wagga on the Kangaroo March, almost 600 kms to Sydney to prepare to fight overseas. They set sail in April 1916 for France, via England. There were other such recruitment marches around the country, including the Kookaburras (from Tooraweenah to Bathurst), the Waratahs (Nowra to Sydney) and The Men From Snowy River (Delegate to Goulburn). This book would be an ideal resource for primary school students studying the ANZACs and Australia’s World War One history. It is brimming with well-researched information and contains many interesting anecdotal facts and stories about the Kangaroos, and about what life was like for people of Bill’s generation, and facts and statistics about the reality of their situation. This is also a personal story about one man and his family, and about the sacrifice he undertook by serving our country. It includes photographs, a poem, copies of correspondence, lists of men who served, and a useful glossary of terms (great for younger readers). The book features illustrations by the author and by Lauren Hakala.